Qualified as a Forest School Teacher in 2012 after being inspired whilst volunteering on Forest School days run by Redcliffe Nursery and with Bristol Forest School. Her previous experience working as an English teacher (2 years) and for the Wildlife Trusts (4 years) provide a good basis for becoming a Forest School leader along with a love of nature from growing up in the middle of the Devon countryside. With 3 young boys Rachel loves spending most of her time in the outdoors and understands the importance of time spent in wild spaces. Has worked with Children and Young People for the last 4 years in a variety of settings including schools, a community garden, community centres, youth centres and other various outdoor settings. As a qualified Forest School Leader and a JNC Level 7 Youth Worker Lisa is also currently completing a Masters in Youth & Community Work. She strongly believes the nature connection is important for everybody and loves seeing the children and teenagers grow and develop as result of those essential experiences. Currently studying for the Steiner teacher training. She has 2 years of experience of working with children from kindergarten to class 6 on a diverse range of subjects including languages, handwork and forest school among others. She is enthusiastic and ambitious and loves playing in the woods in all sorts of weathers, although she particularly enjoys rainy and muddy days. Has worked with Wild Wood Forest School since the outset managing his time around band commitments. 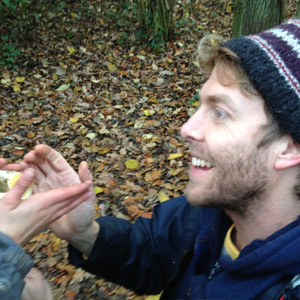 Jamie’s fun approach and love of the outdoors is a tremendous asset and the children love him.